There are so many different vehicles on the market right now and it can be pretty difficult to discern between options. If you care about technology in your vehicle then you may want to take a close look at the line of Toyota vehicles that we have here on our Lithia Toyota of Missoula lot. Toyota vehicles come with Entune technology. 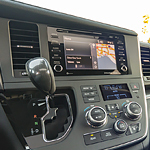 Toyota Entune is an integrated multi-media navigation system that provides all kinds of information to your vehicle by way of satellite. You get up-to-date information on sports scores, weather updates, stocks, fuel prices and traffic. This information comes from having a current cell phone plan that you can hook up to your SiriusXM account through your vehicle. Most models come with a free trial period. The Entune system has voice recognition for ease of use while you drive. Stop down to Lithia Toyota of Missoula to check out the details of Toyota Entune for yourself!